The 2019 British Columbia FIRST Tech Challenge Championships were held on Saturday February 23, 2019. 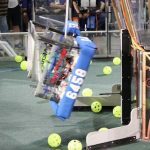 The British Columbia FIRST Tech Challenge Championships will be held on Saturday, February 23, 2019 at St. Michaels University School (3400 Richmond Road, Victoria). Families are welcome to come and watch. The best robot viewing is probably between 2-4pm.